How did I come up with this Splish Splash bath costume idea? 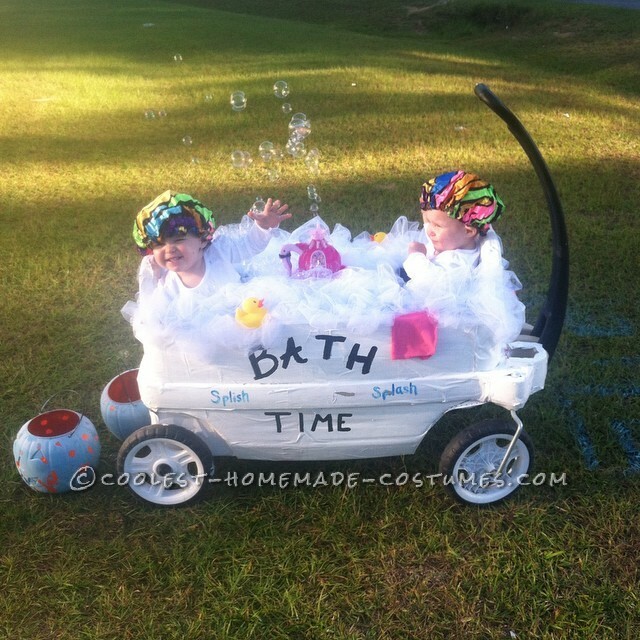 I always want something different as a costume and this year my daughters seem to love a bubble bath so I thought it would be creative and entertainment for them to keep them still! Also a plus on the wagon since I did not have to carry them! Here is a little info in making this costume pretty simple after some steps! Painted Bath Time on both sides and splish splash and the girls names on back of their seats! Hot glued the bubble machine to the middle. Added the girls in their simple outfits and a shower cap and the task is finished! I know while making this my Facebook friends probable thought I was building a 100 story building because I complained about those first steps, but the rest was a breeze. Just a tip for any future people who may want to pull this off it is probably easier if you buy the white vinyl and do not misplace it instead of using colored scrap cricut vinyl to cover the wagon like I did! It was a major pain as in my back felt like it may have wanted to break through that process, but after that the rest was fun! Everyone was amazed and random people stopped to take pictures with the girls because they thought it was the most amazing costume. The picture does not do it justice! Also it has got 4 shares in 2 hours on facebook and over 120 likes so far with many comments saying it would be hard to top this one next year! So overall I think this costume was a major hit!